Feat members of MAKAJODAMA, MAGNOLIA and ANEKDOTEN. 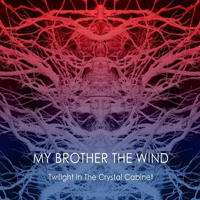 In a world where most things are overthought and music has become more and more technical, Transubstans Records is proud to present a truly spontaneous, organic record: MY BROTHER THE WINDs "Twilight in the Crystal Cabinet", a completely unrehearsed album recorded in 2 hours on a vintage Ampex 16 track 2" tape machine at Drop Out in Åmål, Sweden in May 2009, and mixed within 2 hours the very next day. The band consists of Nicklas Barker (ANEKDOTEN) on guitar, Mathias Danielson (MAKAJODAMA, and formely of GÖSTA BERLINGS SAGA) also on guitar, Ronny Eriksson (MAGNOLIA) on bass and Tomas Eriksson on drums: four relative strangers who with this record capture the achingly beautiful, melancholic music magic that ensues when talent and intuition meet and marry, and the inspired result casts its hypnotic, psychedelic spell on us all. "Twilight in the Crystal Cabinet" is comprised of six utterly improvised tracks, the spirit of which is honoured by its real-time, respectfully untampered mixing and resulting in the most honest, perceptive, sonically cinematic experience in recent decades. A bewitching culmination of pure, unedited creative energy - from the soul, through the fingers, directly to tape. It doesn't get any more real than this.